In honor of Sci-Fi November, I’m featuring sci-fi picks for my Waiting on Wednesday posts this month. 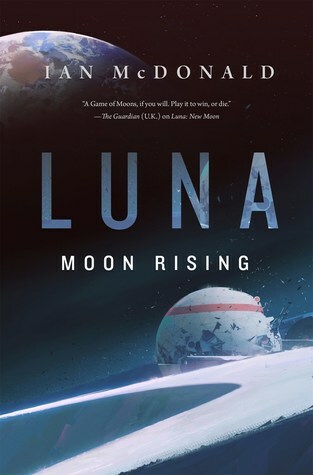 Up next is the third book of Ian McDonald’s Luna series, which has been described by many as “Game of Thrones on the Moon”. What most of us thought was a duology turned out to require one more book to round out the ending, and this is the highly anticipated conclusion we’ve been waiting for. OOh intriguing pick! That’s a new to me one! I’m always a little hesitant about space books because they can be confusing for me sometimes. I hope you will love this one once you read it! What a cool cover! This one sounds a tad bit too sci-fi for me (I’m a sci-fi newbie) but I do hope you love it! Yeah, this series overwhelms me sometimes too. Plus, the relationships are just so complex! Maybe one of these days I’ll get to this series. Oh my goodness! There’s a date! There’s a date!!!! Ooooo, this sounds cool! I love duologies but I love it even more when there is another book to make the series feel more complete. I hope you enjoy this book when you get the chance to read it – hopefully it does not disappoint! Ugh I hate waiting for releases so far in the future! I’m so impatient to own them…yet I then take ages to read each one!